Make best buds with any tastebuds. Kids of all ages love the satisfying crunch from our expertly seasoned Popcorn Shrimp. Coated in a golden crispy breading, they’re guaranteed to add a pop of flavor to any meal. UNCOOKED. KEEP FROZEN UNTIL READY TO COOK. Remove shrimp from package before cooking. MICROWAVING IS NOT RECOMMENDED. 3. Arrange uncooked shrimp in a shallow metal baking pan, leaving space between shrimp. 4.nBake uncovered 14 to 16 minutes* until coating is golden brown and crunchy. Turn shrimp over after 8 minutes of cooking. *FULLY COOK SHRIMP TO AN INTERNAL TEMPERATURE OF 145°F OR HIGHER BEFORE SERVING. 2. Fry at 350°F for 2 to 3 minutes until golden brown and crunchy. 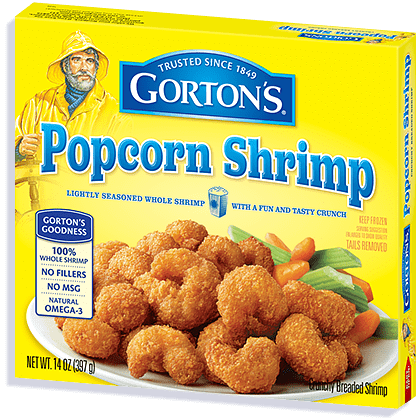 SHRIMP, ENRICHED BLEACHED WHEAT FLOUR (FLOUR, NIACIN, IRON, THIAMIN MONONITRATE, RIBOFLAVIN, FOLIC ACID), VEGETABLE OIL (COTTONSEED, CANOLA, AND/OR SOYBEAN), WATER, LESS THAN 2% OF: SALT, MODIFIED CORN STARCH, SUGAR, BAKING POWDER (BAKING SODA, SODIUM ALUMINUM PHOSPHATE), YEAST, ONION POWDER, YELLOW CORN FLOUR, GARLIC POWDER, WHEY, WHEAT FLOUR, PALM OIL, HYDROXYPROPYL METHYLCELLULOSE, SODIUM DI-, TRI-, AND POLYPHOSPHATE (TO RETAIN MOISTURE), NONFAT MIK, COLORED WITH PAPRIKA, ANNATTO, AND TURMERIC EXTRACTS, NATURAL FLAVOR, CARAMEL COLOR, SODIUM BISULFITE (PRESERVATIVE). Not a significant source of sugar, vitamin A and vitamin C.